"There is so much beauty in the world. So many gorgeous things surround us every day — everything from nature to beautifully designed urban spaces to kittens on the Internet. But there's one beautiful thing we often forget — ourselves. Every single one of us is a unique, unprecedented, beautiful human being that make this world worthwhile. However, many people tend to overlook this fact and resort to feeling unhappy with their appearance, wanting to change the way they look, walk, and talk. A video by Shea Glover, an 18-year-old student from Chicago, perfectly speaks to this topic and reveals the harsh truth — we really are our own worst critics. Heck, even taking a compliment has become an issue! Glover was working on a high school project where she invited students and teachers to pose for portraits. "I conducted an independent project which evidently turned into a social experiment regarding beauty," Glover writes. "I'm taking pictures of things I find beautiful," she said. You will not believe the impact this one sentence had on all of Glover's subjects. Some of them got incredibly shy, others happy, some even got mad, but none of them could hide the raw emotions one simple word caused. 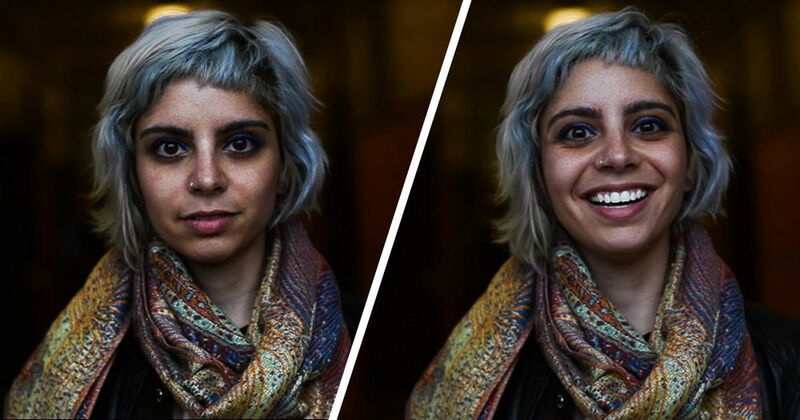 These photos prove what a difference simple compliment can make. Be sure to pay one today — to others and, most importantly, to yourself. "